If you’re a cat owner, you know just how wonderful cats are. Not everyone understands how special felines are (even if they can be super weird sometimes). There are few downsides to owning a cat – except one. First of all, no matter how much odor protection a cat litter may advertise, it always still smells pretty unpleasant. Second of all, cat litter gets literally everywhere. And it’s not your cat’s fault. Most cats hate the feeling of litter on their feet and try their best to get it all off, but they inevitably get it all over the floor anyways. That is why buying a cat litter mat is a great investment for any cat owner. Now we aren’t promising that a mat will completely rid you of your litter dilemmas. But it will certainly make a difference and keep the majority of cat litter contained in that area. To help you out, we’ve hunted around for the best cat litter mats out there so you don’t have to play trial and error with a whole bunch of them. First and foremost, we wanted to pick mats that actually do what they are intended to do: catch litter. But, more generally speaking, they should keep all sorts of messes to a minimum. 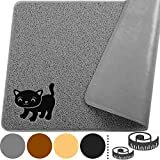 A good cat litter mat should be waterproof (because cats can have accidents too), easy to clean (for when those accidents happen), and soft and pliable in texture so that your cat feels comfortable walking on it. So, we looked for all of those features in the litter mats you’ll find on this list. We also wanted cat litter mats that are durable and non-slip (though you will probably be tucking it under the litter box somewhat, which should hold it in place if the mat slides around some). We also looked for mats with a large surface area. Since litter spreads around easily, the more mat you have to catch it the better. Lastly, this mat should first and foremost serve its practical purpose. But, it also doesn’t have to be ugly. After all, it’s a part of your home so it should look at least semi-decent! Beyond that, most mats will help you out on your quest to keep litter from spreading to all corners of your house. But, these mats will be your best bet. If you need a little help picking out a mat to put under your litter box and don’t want to throw down money only to realize that your mat is useless, you need to keep reading. This list contains some of the best cat litter mats for all kinds of kitties. 5 STAR AMAZON REVIEWS (Over 5000): Amazon users have spoken and they LOVE the Easyology Premium Cat Litter Mat. Voted #1 Cat Litter Mat on Amazon by several online magazines. What do they like. Ultra soft comfort for kitty, durability and the elegant but efficient- litter trapping design! PREMIUM AND DURABLE MATERIAL THAT LASTS: Why are we different. Extra thick and extra large PVC material that wont tear like other mats out there. The groves created by our unique patented design trap up to 37% more litter than other mats. EASY TO CLEAN AND MAINTAIN: Ultra-lightweight (2.2 lb) water resistant plastic material is super easy to clean. Simply shake it off, vacuum it or give it a quick rinse to clean it! LOOKS FANTASTIC AND WORKS LIKE A CHARM- Protect your floors from litter scatter in style! The modern, patterned material and chic colors compliment any Home Décor. NOW AVAILABLE IN JUMBO SIZE FOR 2 OR MORE LITTER BOXES ( Search for Jumbo Easyology): 100% Satisfaction Guarantee - If you don't Save Time & Money by using the Easyology Premium Cat Litter Mat then we will refund your money NO QUESTIONS ASKED. This is our iron-clad commitment to you. Click Add to Cart Now! If you want a litter mat that covers all of your bases, this is the mat you should get. The Easyology cat litter mat traps even super fine litter, is easy to clean, and water-resistant. It’s also made of a very durable PVC material in a design that traps up to 37% more litter than other mats. This mat also is known to be more comfortable on cats’ paws than a lot of other litter mats out there, and the woven fibers also help clean your cat’s paws when they’re done using the litter box. This material can easily be vacuumed or rinsed for cleaning purposes, or you can just shake it out to release the excess litter from deep in the fibers. It is also a very large litter mat at 35 by 23 inches that could easily accommodate two litter boxes. The Easyology litter mat also is made with a skid-resistant underside. This rubber backing also help protects your floors from any accidents or staining. 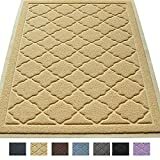 It also looks kind of like any nice-looking doormat and comes in eight different colors to match the room where you keep your litter box. Lastly, the mat is BPA-free and phthalate-free, meaning it isn’t toxic to your cat or to you. This is without a doubt one of the best cat litter mats out there. It’s been voted the #1 cat litter mat on Amazon by several online publications. And it will cost you less than $20! Ok, this cat litter mat is a little different than ones you’re probably used to seeing – but we really think it’s worth your while! The 3D microfiber design of this cat litter mat is surprisingly effective at catching all kinds of cat litter. All of the microfiber strands are different sizes and densities which helps catch all of that litter, particularly any residual litter on the bottom of your cat’s paws. Not only will it catch the litter on your cat’s paws, but also this litter mat is super soft and cushy for any kitty’s paws. The material is eco-friendly too! You might think that the microfiber won’t be very helpful when you cat accidentally urinates on the mat, but it does have a durable and textured back to prevent any leakage. It’s also machine washable, which we really, really love. You have to shake out the litter first, but after that just throw it in the washer! You can get this cat litter mat in two sizes, as well as in three different colors. We seriously urge you to give this one a shot! HEAVY DUTY: THIS MAT WEIGHTS 3.6 LBS! Compared to other mats we decided to make a high quality catcher that lasts a lifetime. A heavier cat litter mat means it's less prone to tear & rip PLUS deeper loofah to catch more litter. Don't say we didn't warn you! EFFORTLESS CAT LITTER MAT TO CLEAN & MAINTAIN: Pour the litter back in your litter box, shake it, vacuum it, scrub it, the choice is yours. With this litter catcher mat you don't need to worry about damaging it, because it wont. URINE PROOF & SLIP RESISTANT: Got a kitty that tends to make accidents outside the cat litter box? We too. The laminated bottom prevents urine from soaking through to your floors and will keep the mat in a stable place. ZERO HARMFUL CHEMICALS: We started the trend and with cat and pet friendly materials, and we will lead it too. This cat litter trapper mat is free from BPA and Phthalate. A 100% COMMITMENT: We don't compete on price (that's for others), we provide unparalleled quality and service. It's simple, if you aren't 100% happy, you'll get a full refund. This cat litter mat is the Holy Grail for any cat owner who needs a really, really big one. Seriously, this cat litter mat comes in two sizes: Extra-Large and Jumbo. Enough said. It’s also a really deep mat so it can catch a whole lot of litter. The cat litter mat is also very heavy duty and should last you a very long time. Because it’s so durable you can vacuum and scrub it clean very easily. The bottom of this cat litter mat is laminated so any accidents your cat may have won’t seep through and damage your floors. The lamination also prevents the map from slipping when your cat jumps in and out of its litter box. This very large Smiling Paws Pets cat litter mat comes in four neutral colors – beige, black, brown and gray. So it’s nothing fancy, but it will blend in with any room. Like the last cat litter mat, this one is also free of any harmful chemicals. It’s definitely a well-rounded, highly effective cat litter mat – especially if your cat tends to make a big mess when they use their box! All right, this cat litter mat isn’t the prettiest. But it is a very good choice if you have a cat that is very messy with the litter box. The mat has two layers: a urine and waterproof bottom layer that has a plastic film to eliminate any chance of leakage, and a top layer with large holes to catch the cat litter. The top layer is very smooth so it’s comfortable for your cat to walk on. These two layers split apart, so you can put a puppy pad in between them if your cat tends to pee outside of the box frequently. If your cat does have a penchant for messy litter box use, you are also probably wondering how this cat litter mat cleans. Well, you can shake out the trapped litter into the box or vacuum it. Or, you can wash it with soap and water and then let it air dry. 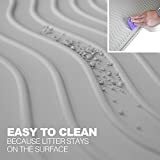 To be honest we are a little skeptical about the cleaning aspect of it, simply because a cat that is very messy with its litter box will need a cat litter mat that can be seriously deep cleaned. It may clean just fine with soap and water, but the nylon edges can get soaked with urine and those aren’t easily cleaned. 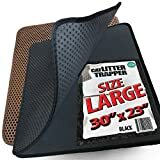 However, many reviewers say that this cat litter mat is insanely good at catching litter, so perhaps that outweighs the potential cleaning issues. For a cat litter mat that is great and containing litter and super easy to clean, we recommend this ToughGrip mat from PetFusion. This cat litter mat has elevated ridges and a raised outer lip to keep litter very contained. And once you’re ready to clean up that excess litter, you can just fold the mat and dumb clean litter back into the litter box, or sweep, wipe or vacuum it clean. This mat doesn’t have the threading you see on other cat litter mats, so it is far easier to clean and you can actually see that you are getting rid of all the litter. This also prevents the build-up of any mildew or bacteria. It is also pretty comfortable for your cat to walk on, however it doesn’t necessarily pull kitty litter directly off your cat’s paws. It’s also the most expensive out of all the cat litter mats on this list. But it is anti-microbial and has stain resistant properties, and it certainly will not leak anywhere. It’s actually made with FDA-grade hygienic silicone. The design is simple and utilitarian in a nice, neutral light gray. Basically, this is the cleanest cat litter mat you are going to find. Well, the easiest to keep clean at least. Which is super important because cats sure are cute but man, are they messy! Ultimately, you are going for a cat litter mat that fits your definition of clean. Whether that means it traps the most litter, or is the easiest to clean up and keep sanitary is completely up to you. You also should observe your cat’s litter box behaviors before you buy a cat litter mat. For instance, if your cat jumps out of the box and sprays litter everywhere, you will probably want to get a very large mat that is good at trapping those particles. But, let’s say your cat tends to not only get litter on the floor, but also to “miss the box.” Well, you will probably want a mat that is very easy to clean and easy to keep sanitary. For a cat like this, a mat with a lot of fibers and “webbing” isn’t the best option because urine can get trapped deep in the mat no matter how hard you clean it. This will lead to some icky odors and a lot of gross mildew growth. All of the mats on this list have really great features, and they also have their downsides. So, your choice of a cat litter mat really has to be based on your pet’s behaviors. You also want a mat that is very durable, but also low cost simply because eventually it may just have to be thrown out. As you can see from this list, it isn’t difficult at all to find an inexpensive cat litter mat that is also very effective at preventing messes. And lastly, be patient with your kitty once you buy your cat litter mat! Cats are very used to routine and everything being in its place, so introducing a new cat litter mat into the picture might throw them off for a bit. Once your cat adjusts to the mat, they will probably be very happy to not have so much litter stuck on their paws after they go to the bathroom. And of course, you will be happy because you won’t have litter scattered all over!